The annual Specialty Equipment Market Association (SEMA) trade show in Las Vegas, NV has become a treasure trove for the automotive elite, as a vast array of industry insiders, media members, and manufacturer’s representatives assemble to examine the hottest new companies, parts, trends, and of course the upper echelon of display cars from around the world. The custom-built cars and trucks housed in the gigantic showcase seem to grow more outlandish each year, conceptualized to outdo one another from their infancy. They are finished with innovative lighting solutions, the most reflective vinyl wraps, and the widest body panels, all in an effort to grab the valuable attention of the event’s attendees. While most vehicles are flamboyant in their attempts, there is glory in subtlety. This past November, I entered the massive Central Hall of the Las Vegas Convention Center and was immediately force-fed vehicles from our nation’s auto manufacturer with the blue oval symbol, as their display was front-and-center upon my entry. While glancing through their display into the hall, I set my sights on the Axalta paint booth nearby, where my soon-to-be-favorite car from the collection of halls was displayed. Placed adjacent to a flashy burgundy metallic painted lowrider Ford with some extremely intricate paint designs was this spotless subdued grey Porsche. In my opinion, no other car at SEMA’s 2016 exercise in excess displayed more perfect finesse than this Porsche 930 Turbo. Reminiscent of a vintage racecar battling visibility through the fog, the selective yellow headlights of this 911 variant were the perfect period-correct contrast for its flawless grey paintwork and super wide black Fuchs–style wheels. Maybe my outlook is biased because my personal Honda Civic is covered in a similar muted grey hue, maybe it’s because this car is executed so perfectly, or maybe my fascination is the result of the fact that this car has the ability to stand out while sporting its OEM body, a charming rarity at the SEMA show, where a sea of bolt-on fiberglass-widened vehicles dominate the event floor. Immediately smitten, I circled the car and loved the rather basic look of it and wanted to know more. I glanced down at the build card conveniently placed next to the passenger side fender and was intrigued to see that the car was from New Jersey, just across the bridge from my home state of Pennsylvania. The builder’s name, Rob Ida of Rob Ida Concepts, immediately rang a bell; as a close friend of mine had just visited his shop for an open house a couple months prior to SEMA. Ida’s early life began in the family business at Ida Automotive, where, under the wing of his father, Bob Ida, Rob started building cars at the age of seven. Today, he can proudly say he’s been building cars professionally for over twenty-five years. “At eleven years old, I put my first car together and have stuck with it ever since. I’ve never had a job,” says Ida. Today, Ida Concepts is responsible for countless hot rods and off-the-wall custom built vehicles, many of which have graced the pages of the world’s foremost automotive magazines. Their perfectly-sculpted creations are no strangers to appearances everywhere from the unforgiving Salt Flats of Bonneville to the gleaming floors of the SEMA show, and even on the silver screen in Frank Miller’s Sin City: A Dame to Kill For. Ida formed a personal affection for the air-cooled Volkswagen chassis early on, and over time, his admiration slowly shifted to the comparable Porsche marque. The first variant to enter his capable hands was an all-wheel-drive, water-cooled Turbo model, but it just didn’t appeal to him like the air-cooled models of the past. His attention reverted back to the Porsche 356, and he even owned a few naturally-aspirated 911 models before landing on the ultimate mixture of them all; the Porsche 930 Turbo. Nicknamed The Widowmaker because of its outrageous turbocharged power output, wayward handling, and spartan safety features, these cars became infamous for eliminating their operators in fatal motoring accidents. “I never paid too much attention to them because of the aesthetics. That’s when I thought if I could get a 930 Widowmaker and switch out some of the ‘80s looking hardware, maybe I could bring out the true beauty of the car,” he says. By this time in his career, Ida had become famous for grafting his own personal touches into the smoothest chassis bodylines on the planet, and he knew he could reshape the disagreeable bits of the highly regarded sportscar. “The wide hips and the intercooler hanging out the back was radical-looking. The accordion bumpers and under-bite was the area that left room for design changes. I knew that Porsche designed a beautiful car, but needed to settle for the bumpers that DOT and US-mandated safety standards would approve. That’s where we found the most design improvement,” says Ida. He found a female-owned 1986 Grand Prix White example nearby in New Jersey and knew it had the potential to become even better with his vision. Prior to Ida’s ownership, the performance-driven female owner had upgraded various aspects of the drivetrain including the turbo, exhaust, intercooler, performed a twin-plug conversion, improved the ignition system, and more. “Most times the models I pick already have a religious-type following. When we build a gasser, we want a guy that raced gassers in the ‘60s to say that we nailed it – same with Porsche. We want guys who live and breathe Porsche to look at our car and feel like it’s textbook correct, even if it has new ideas,” says Ida. First and foremost, Ida tended to the car’s stance, his favorite alteration to the car. Too frequently the width and overall sizing of a wheel is used to guide a build, but not enough emphasis is placed on a properly fitting tire. Ida let the rear tire fitment dictate the vision for the car, and it shows in the final product. He knew he wanted a performance tire with a minimum width of 300 mm stuffed under the wide original rear fenders; he also knew the height of the sidewall, and how a proportionally-correct matching front tire was just as important to the overall stance of the car. The tires he had in mind ended up being quite difficult to find. Using one of his sources in the United Kingdom, Ida was able to track down and purchase the obscure new-old-stock period-correct P7 Corsa DOT slicks from Pirelli in Europe. Using a staggered diameter and staggered width wheel setup, Ida fitted custom Braid USA BZ Classic wheels measuring 16×11-inches in the rear, and 15×8-inches in the front to the tires. Motion Control Suspension’s coilover damper setup and dropped spindles gave him the ability to lower the car to his ideal height. “This allowed us to slam the car down on the shop floor, bumperless, so we could start designing a bumper that didn’t update or backdate,” says Ida. 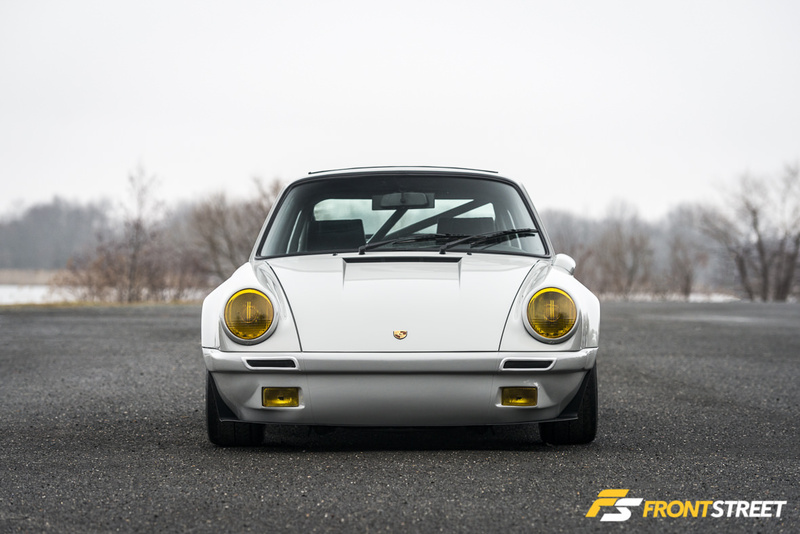 Knowing he wanted the bumper to match the original lines, Ida designed a mockup that fixed the dreaded under bite, freed the car of its hideous oversized accordion bumpers, and cleaned up the original look, while keeping the iconic rectangle driving lights that define the 930 to legions of Porsche devotees. It also incorporated newly designed custom brake ducts to showcase the first piece of brushed aluminum, which is also found elsewhere on the car. “The changes should have the sensibility of the type of car you’re working on. They don’t have to be built out of a mail-order catalog to achieve that. You can make careful changes that still play to the theme,” says Ida. The body of the car was then fitted with numerous other upgrades, which included a custom rear bumper, a brushed aluminum taillight garnish, and a special side view mirror, all carefully designed specifically for this chassis. The mirror reproduces the 356 GT style by mounting the reflective glass on the car’s fuel door, located just ahead of the driver’s side door, to give a streamlined nostalgic touch. After designing the bespoke front bumper, he enlisted the help of fellow builder Artie Zygnerski, who ended up putting in several late nights and weekends in order to help get the rest of the car together and ready for its glossy liquid coats of Spies Hecker “Blau Grau Hell” paint – German for “Blue Grey Light”. The color was originally offered on a ‘60s Daimler commercial truck but looks right at home on this Turbo. Along with the drivetrain additions installed prior to Ida receiving the car, the 3.3-liter turbocharged engine was treated to a refresh from local air-cooled guru Lou Hodi of Hodi’s Performance in Old Bridge, New Jersey. A new intercooler from a 964 Porsche was deemed fit for use, while the turbocharger was replaced with a Borg Warner Performance K27 model. Ida even incorporated unpainted fiberglass – famous for populating the historic Porsche 917 racecar – into the bay of this 930 to pay homage to Porsche’s illustrious contender. Inside the car, a roll bar from New Development Fabrication was installed to increase rigidity, provide a place to mount the Racer’s Choice harnesses, and furnish added safety in the treacherous cockpit of the notorious automobile. Ida even fabricated custom OEM-look panels to conceal the roll bar’s mounting points. The harnesses were threaded through new custom-designed GTS Classics seats covered in basket-weave leather and suede on a color-matched shell. Finishing the driver’s contact points, a set of tailored pedals, wood-grain shift knob, and a Renown USA 100 Dark Competition suede steering wheel were installed. With his sights set on displaying the car at the 2016 SEMA Show, Ida and others worked tirelessly to finish the car and get it shipped out to the big event. He had his reservations about bringing such a subtle car to such an overwhelmingly-ostentatious event, but his fears were soon put to rest as the 930 garnered an amazing response. “I wasn’t sure if it would fall into the background with its understated color and styling amongst the widebodies and SEMA-esque attention getters in Las Vegas. But the car was received extremely well,” he says. This car certainly caught my attention and has held it uninterrupted since I first laid eyes upon it. In his signature style, Ida has proved to the masses that it’s unnecessary to build progressively-elaborate vehicles with garish upgrades just to draw a crowd. Like I said earlier, there is a certain glory in subtlety.